However, facilitating reimbursement for virtual care isn’t the only hurdle that healthcare providers need to overcome to boost the use of telehealth services. Telemedicine covers a wide range of services, from phone calls and video chats to remote patient monitoring and store-and-forward imaging. But despite the anticipated growth of the global telehealth market to more than $36.3 billion by 2020, the number of healthcare consumers who have tried it remains dismally low. Lack of awareness could be keeping the numbers down. In a recent Physician 360 article, Dr. Angela Fusaro wrote, “Unlike a hospital or urgent care center, you are not going to naturally encounter a telemedicine service in your everyday routine; it is a resource that must be discovered. And despite being in a culture of heavy internet and mobile application users, many still have no idea whether their provider or insurance carrier offers them access to virtual care.” Hence, healthcare providers need to effectively market their virtual services to increase patient acquisition. To address this hesitation, start with healthcare consumers who have expressed an interest in virtual visits. But how do you identify these patients? Interest, however, doesn’t always equal action. Healthcare providers also need to understand what makes some patients more likely to embrace virtual care than others. The c2b psychographic segmentation model identifies healthcare consumers based on their motivations, priorities and preferences. In turn, providers learn where patients seek out health information and the main channels through which they communicate. Providers can then align their marketing efforts and services with different audience’s needs to drive engagement. So, which segments are most likely to utilize virtual visits? 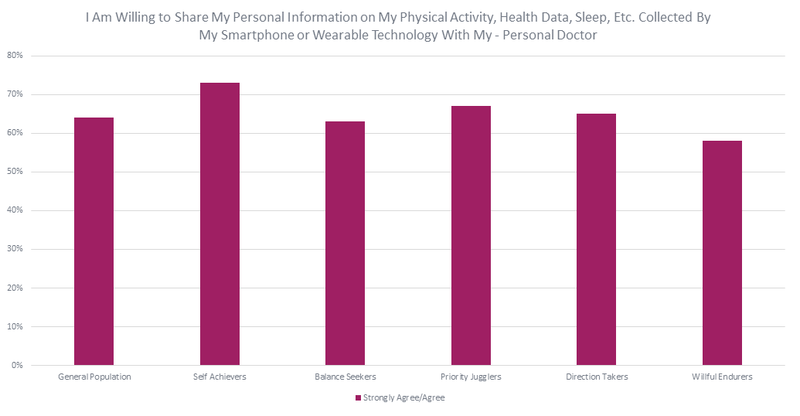 Self-Achievers and Willful Endurers are statistically more likely than the other segments to use telemedicine in the last 12 months according to the c2b Consumer Diagnostic. Self-Achievers are proactive when it comes to wellness and like to stay on top of their health goals. If they can’t meet with their doctor in-person, they’re likely to turn to telemedicine as an alternative to meet their goals. Likewise, Willful Endurers are known for “living in the moment,” which can make them hard to motivate. However, 39 percent of Willful Endurers are Millennials, who are twice are likely to consider telemedicine than their older counterparts. Healthcare providers can market the convenience of virtual visits to Millennial Willful Endurers to overcome their tendency to avoid the doctor, except as a last resort. Telemedicine has already proven its value for veterans and rural patients. Recent trends suggest it has the potential to improve access to healthcare, reduce costs, increase efficiency and generate revenue on a larger scale—if healthcare providers market it to the right patients, for the right reasons. For more on psychographic segmentation and how it supports patient acquisition, download our whitepaper.